West Lothian Council has developed an Active Travel Plan for West Lothian, and continues to deliver a number of infrastructure projects to support everyday walking and cycling journeys. Active travel is primarily defined as making journeys by walking, cycling and scooting. It can also include horse-riding (and even running and non-motorised water-based transport.) It is an approach to travel and transport that focuses on physical activity as opposed to motorised means. West Lothian Council has developed an Active Travel Plan for West Lothian, 2016-21. As the title "Making Active Connections" suggests, this is a plan to link people to places by active travel. It is not just about physical connections however - it is also a framework for mainstreaming active travel in West Lothian, and creating a culture where active travel becomes the norm for suitable everyday trips. To achieve this, it is crucial that West Lothian Council works successfully with external partners and with local communities, and "joins up" policies and projects delivered by different Services and teams across the Council. The Active Travel Plan is available here - West Lothian Active Travel Plan 2016-21 "Making Active Connections" [2Mb]. A handy summary guide is also available to share within your communities, workplaces and schools - Summary West Lothian Active Travel Plan 2016-21 [1Mb]. New cycle path improvement being well used by people on foot and bikes, both for commuting to their workplace and for recreational purposes. Access to Armadale Railway Station - linking Lower Bathville Armadale to the NCN75. Bathgate Station and Town Centre Access Improvements - including a bridge over the Bathgate Water eliminating the need to cross Whitburn Road twice within 100 yards. Nettlehill Road Railway Path in Livingston - connecting Broxburn and Uphall to Livingston, numerous employment sites, shopping facilities, Livingston North and Uphall Railway Stations, health care facilities and the local High School. Seafield to NCR 75 - upgrading an existing path to a bound surface significantly improving access to NCR75 and unlocking latent demand for cycling and walking on the existing network. 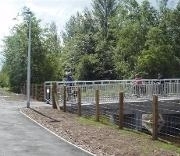 Linlithgow Leisure Centre and Linlithgow Academy / schools on Preston Road - Canal Towpath ramps. Polbeth to West Calder path upgrade. Starlaw West Roundabout to Boghall Roundabout shared use path which now mostly completes an off-road cycle route between Bathgate and Livingston. Almondvale Park, Livingston - for the latest updates, visit Almondvale Park .